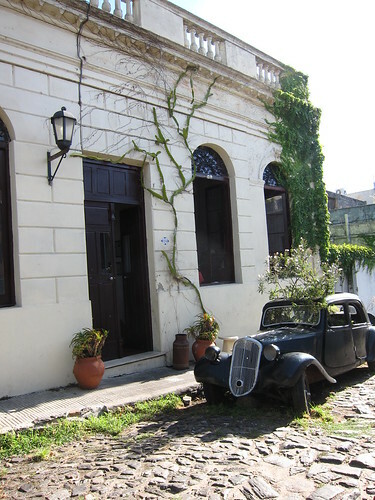 Noelle and I got up early (8:45 is early for us, especially Buenos Aires time) and headed down the street to the ferry station to go to Colonia del Sacramento, Uruguay. Got to the station early only to find a huge line (which more than doubled while we waited there) for checking in. After checking in, we went through immigracion, where the Argentine official stamped us out and the Uruguayan official next to him stamped us in. Then we got on the catamaran for the 50 or so minute ride across Rio de la Plata to Uruguay (the Switzerland of South America, I am told). Right before we left, the skies had opened up and I was afraid we'd be spending the day in the ferry terminal on the other side waiting for our return trip while watching turistas wash out to sea. I fell asleep part way through the trip and woke up when my phone company texted me to let me know we'd crossed the border and different rates applied (actually exactly the same as Argentina, but whatever). After waiting for the rest of the ship to disembark, we finally set foot on Uruguayan shores. To my surprise and delight, the skies were partly cloudy and the sun appeared to be making a reappearance. Colonia is, as advertised, very relaxing. Compared to hectic Buenos Aires, very _very_ relaxing. The tree lined, cobblestone streets were pretty quiet and the architecture (a mixture of colonial Portuguese and Spanish, who fought over it for a while) is largely quite beautiful. Everyone seems laid back and the best thing to do IMHO is to sit at a cafe, have a beer and watch the waves. Noelle and I spent the day exploring the streets, taking pictures, and periodically stopping for a cool drink or something to eat in the shade. We saw a lot of antique cars, a few tourists here and there, some dogs preparing for mischief, and a lot of pretty buildings. It got pretty hot fairly quickly, once the rain clouds passed, so we took a number of breaks. Anyway, a long day, although ultimately a relaxing one. I think I would be happy to return back to Colonia to hang out and chill, should opportunity arise in the future. 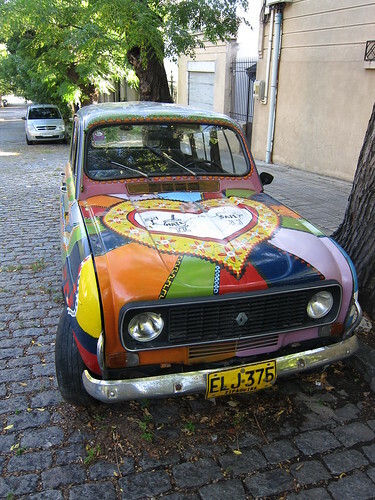 I made a new set for Uruguay in my Flickr sets, just to set it apart. We went on the Buquebus (water shuttle) over to Colonia today. The place is amazing. So beautiful! 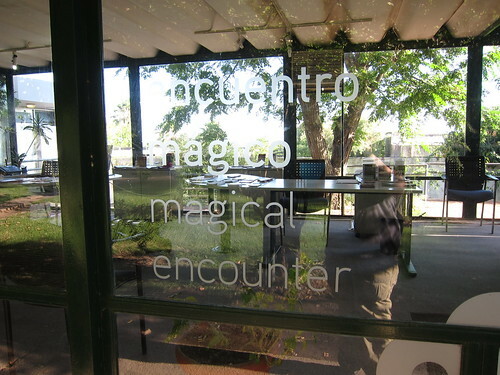 The tourist information booth promised us a "magical encounter" and I think this town delivered! 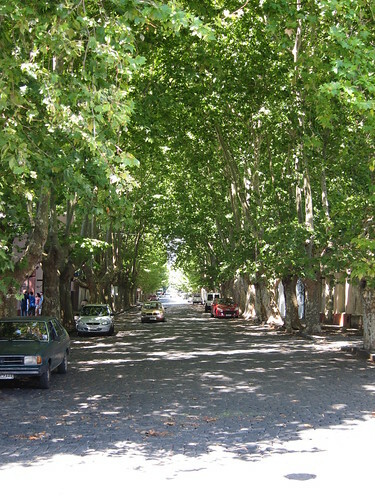 Old beautiful streets lined with arching trees that provide shade and a breeze provided by the ocean make Colonia a beautiful place to spend a day or a weekend and just chill out. Everything is cobble-stoned and charming and full of music and people enjoying themselves there. I'd go back in a heartbeat. It was very hot, sea breeze notwithstanding, so we spent the day alternating between walking and stopping to enjoy the random bench that we would find in a shady or breezy spot, or a having a drink in a cafe. 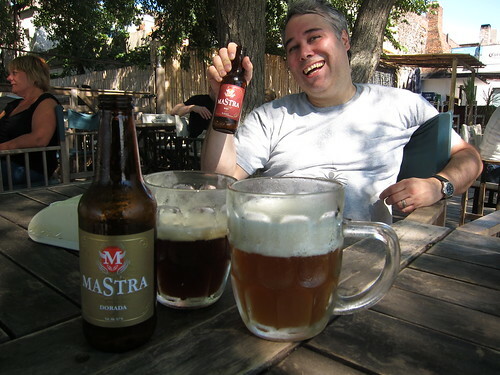 I had a Uruguayan beer that was delicious in the hot weather, and I normally do not like beer very much. 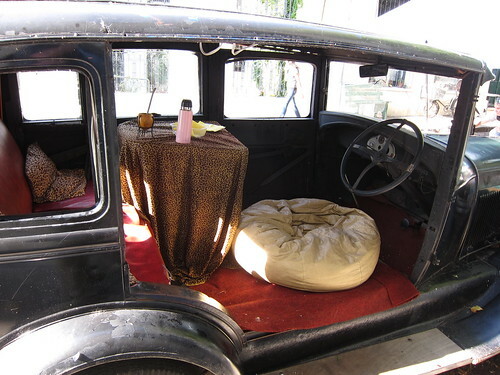 There are quirky cars everywhere, some which obviously have not run in ages, and dogs and cats everywhere, but somehow they seem more like citizens than strays or annoyances. I am super tired from getting up "early" (read: 9 am), and then doing so much walking around, especially after walking around so much yesterday, but it was so worth it! 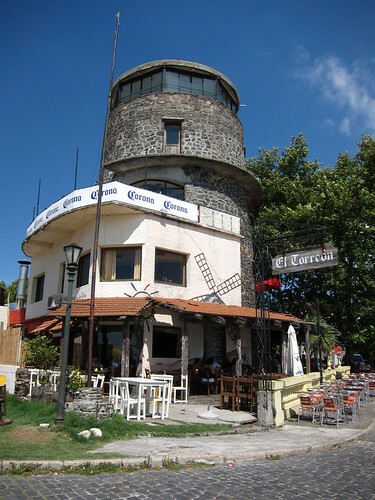 I would absolutely recommend Colonia to anyone who is in the neighborhood and would very much like to go back to Uruguay at some point to see the rest of this country. Or Domingo, as they say here. Got up earlier than yesterday, although still at a respectable hour for a vacation. Went out to the San Telmo street fair which is evidently a weekly market they have selling all kinds of crafts and antiques. It was bloody hot today (Cab driver said 38 C, which is about 100 degrees F by my calculation.) which made the sight seeing a challenge. Starting to see why people go out to dinner at 9pm here. 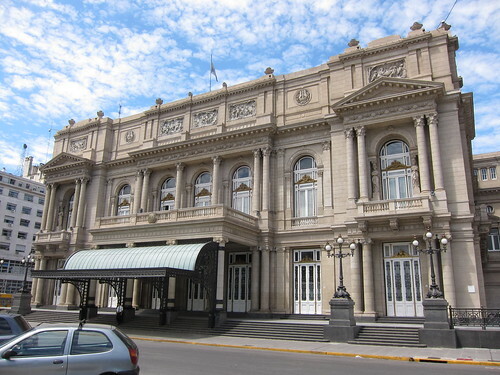 We ducked out from San Telmo to go see Teatro Colon for an afternoon tour, but it is closed until March according to the security guards outside. 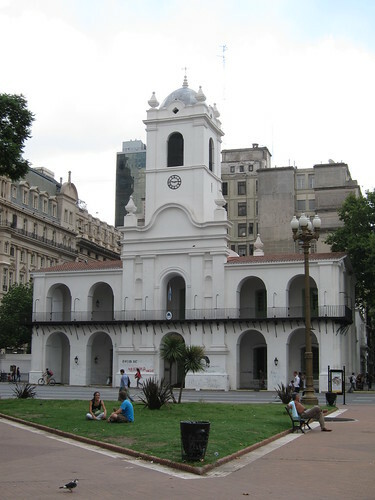 So, we backtracked to the Plaza de Mayo area and went to the city's oldest cafe for some iced drinks and snacks. We went back to the national cathedral (which is gorgeous) and I wanted to get some pictures of the presidential palace because our tour kinda rushed through there the other day. 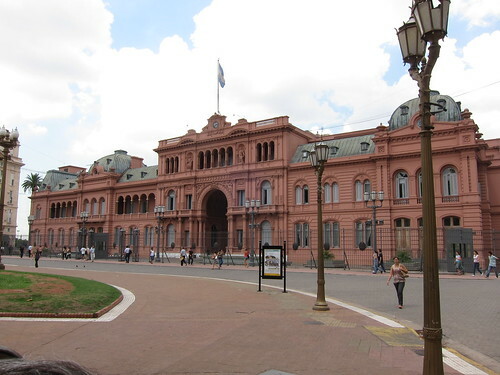 On arriving at the Casa Rosada we found that they were doing a tour of the building, so we went inside, because how often do you get to see the inside of a presidential palace? Noelle fulfilled her dream of singing Don't Cry For Me, Argentina from the balcony (quietly, of course). Hopefully I'll be able to process a picture of that, shortly. Had a quiet dinner near the hotel and spent most of the evening relaxing and planning our adventures a little further down the line. I totaly did it... I am such an embarassment to my country. First, however, let me say that is is a mere 38 degrees here. I have no idea what that actually is, but it's EFFING HOT. Like Africa Hot. Crazy, not fun, wall of hot hot. We got up and went to the San Talmo market which was muy bueno, except for the whole hot thing. It's a really huge street fair/antiques market where they sell pretty much everything you can think of. Some of you will get presents from here. 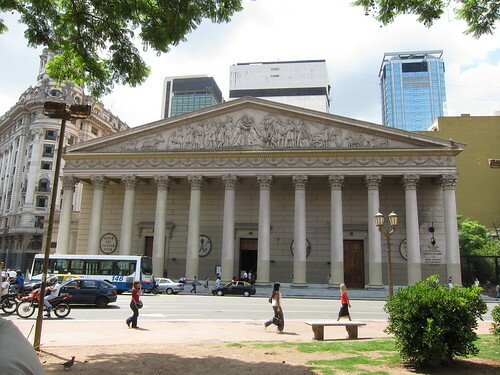 We had a tasty lunch in a cafe there and then headed to Teatro Colon, which is supposed to be one of the world's premier opera houses, only to find out that it is closed until March, so I guess we have a reason to come back to Buenos Aires. Honestly, I don't need a reason; this city is really neat - I'd come back any time. 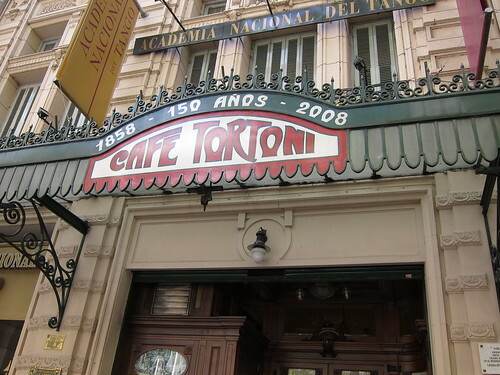 So we packed it on over to Cafe Tortoni, which is a 150 year old cafe in Buenos Aires that looks pretty much the same as when it opened. Then we went back to the national Cathedral so Chris could have some more time to take pictures (that's the church that looks like a museum). 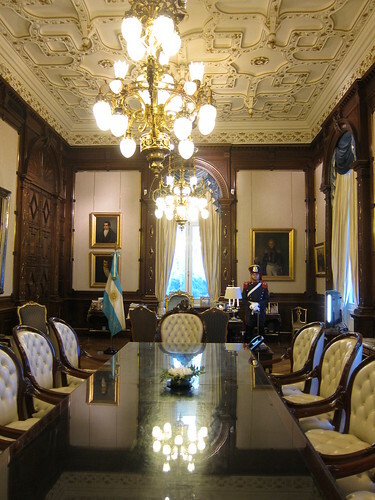 We were walking around Plaza de mayo when we noted that they were having tours of the presidential palace, so we decided to go on one even though it was all in Spanish. They actually took us all the way into the office of the president (she was not in house today), which I thought was really cool. 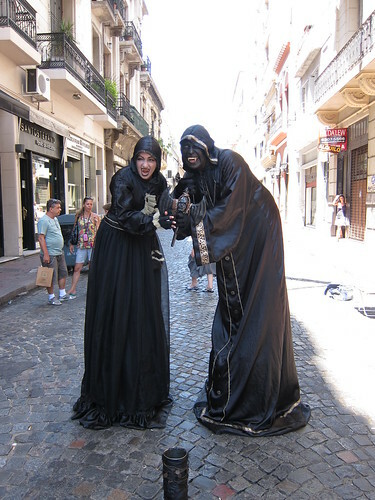 After that we walked to the port to get tickets to go to Uruguay for the day tomorrow. 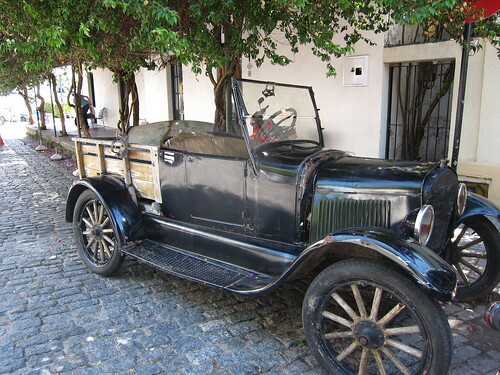 We are headed to a preserved colonial town called, of all things, Colonia. Here's some info on that in case you are interested. Tuesday we plan on picking up anything we missed - maybe going back to the cemetery to take more pictures - and packing before we head to Ushuaia on Wednesday. At that point, posting will get spotty depending on what happens there for 2 days and then not at all for 11 days while we are on the boat, but I will blog as /i go and then bulk post them all when I get back. I've added a few pictures I've taken over the past few days. These are just a representative sample, not necessarily the best. Hopefully they look ok on other people's machines. Editing on the netbook has been a little challenging. I guess technically the first day was almost entirely traveling, but it still seems like the time has gone by pretty fast. 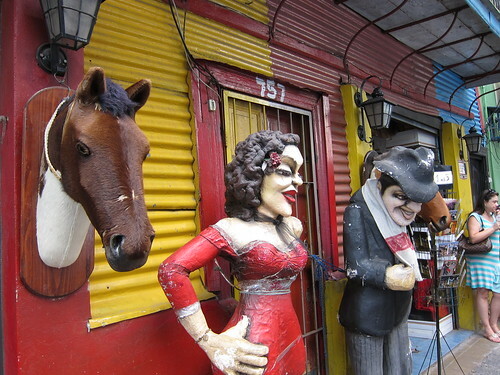 Yesterday we did a bus tour in the afternoon and saw a lot of the sights that Buenos Aires has to offer. We saw the Presidential Palace and the national cathedral, which looks more like a museum than a church on the outside. 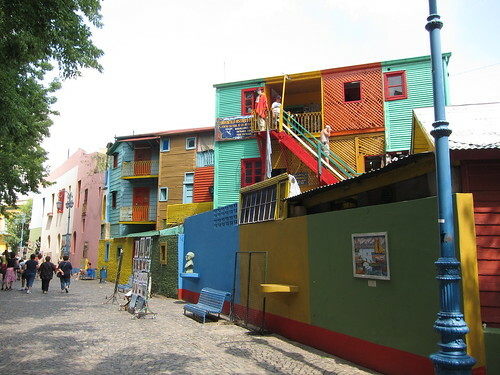 We visited the neighborhood of Boca, where the inhabitants have made buildings out of sheet metal and used whatever ship's paint they had on hand to paint the houses, leading to a very colorful neighborhood. We also went to the La Recoleta Cemetery which is easily the most beautiful collection of mausoleums I have ever seen. Evidently in the 19th Century when BA was in a period of expansion the elites wanted to emulate a similar cemetery in Paris (because everything French was considered good) so they started housing the dead in a cemetery on the site of an old monastery. Showing how rich you were was en vogue, so the mausoleums on site are really incredible. 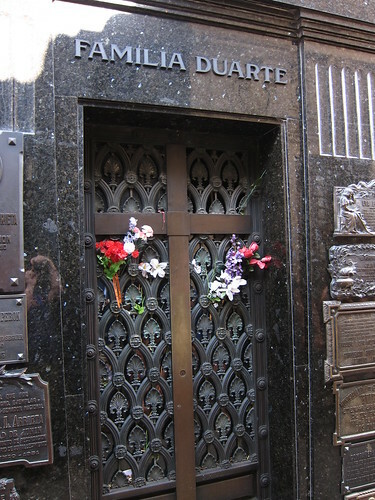 Evita Peron is interred there, so we visited her family's tomb briefly. After the day tour of the city we had a Tango show arranged in the evening and went to El Viejo Almacen, which is a famous tango club in the San Telmo neighborhood. The dinner was excellent (beef empanadas FTW) and the tango show was very interesting too. After an evening of wine, food, and tango, we returned weary to our hotel room and got to sleep eventually. This morning we had a hard time getting started, despite the construction going on on our hotel (on Saturday, really?). 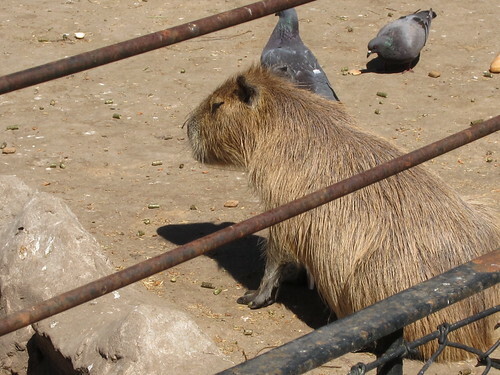 We managed to get out eventually, and went to the Buenos Aires Zoo. This was of interest to me, because I had heard that they have a lot of South American animals I hadn't see before, which they do. We saw Maras, Capybaras, Vincunas, Guanacos, a Nandu, and a plethora of other local critters, as well animals also found in zoos back in the States. Now if we can't see some of these animals in the wild, we have at least seen some in captivity. The Maras were roaming pretty freely all over the zoo and were really quite cute. After returning to home base and quick dip in the pool, we elected to eat in as we're both still a bit tired. The Lomonico Porteño sandwich was outstanding and they had desert "pancakes" that were out of this world. 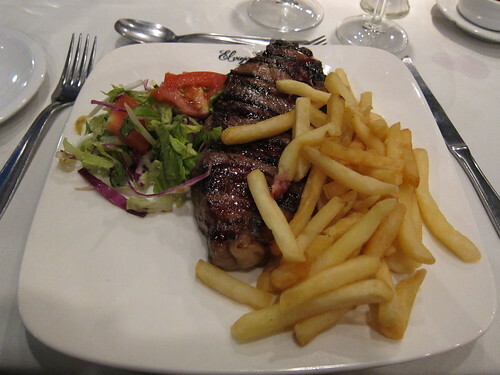 Full now, ready for tomorrow's adventures, which involve a street fair in San Telmo and hopefully a tour of the Teatro Colon, the world famous opera house. More pictures of the zoo today posted in my Buenos Aires set. Chris has MUCH better photos, but you will probably have to wait to see those until he has a proper machine to edit them. We'll see. YES! That *is* pronounced "my poo". 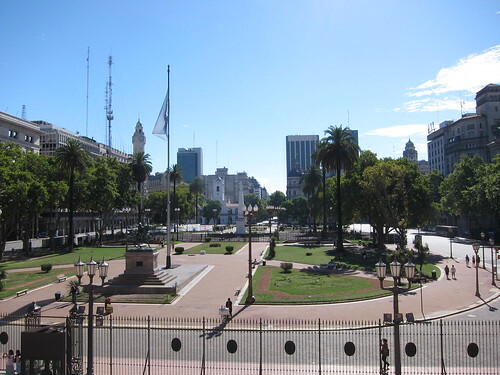 Today we slept in (surprise) and went on a mini-bus tour of Buenos Aires. 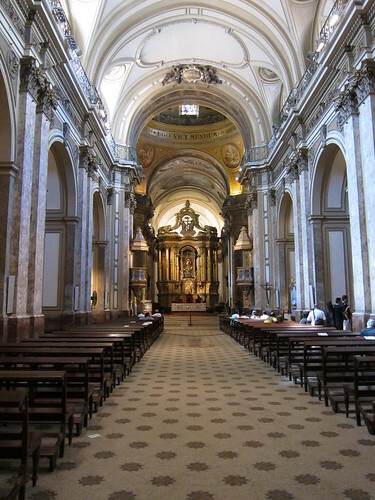 and a church that looks like a museum. 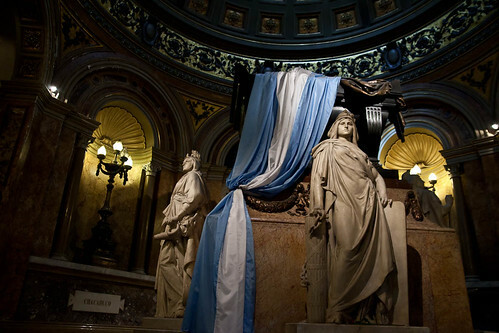 and ended in the cemetery here, and saw Evita's Grave. and saw a Tango show in one of the oldest Tangarias there is. I think we are going to go to the zoo tomorrow...prepare yourselves for some pictures of cute and fluffy south american animals. I have no idea what crack my husband was smoking in his previous post, but I speak enough Spanish to get by very barely, and for sure not enough to communicate if someone goes off of the pre-determined script that my high school Spanish teacher taught me. Chris is good at languages though, so I'm pretty sure he'll be close to fluent by the time we leave. Man, I'm beat. We had a fairly reasonable flight from LAX to Santiago (10.5 hours), although we were pretty tired by the end of it. Just a couple hours in the terminal and another 95 minute flight to Buenos Aires and we were ready to go. Well, after clearing customs (the $140 reciprocity fee actually got us through customs faster), getting a cab, and driving to the hotel. After roughly 24 hours on the move, we finally got our hotel room and crashed for a few hours. BA is a pretty interesting city so far. My miniscule comprehension of Spanish and the locals ability to speak English has gotten me a lot farther than I had expected, so that was a relief. Noelle speaks Spanish, so that also helps. After our nap we went down Calle Florida, which has the most unbelievable number of street vendors I've ever seen. Block after block of them. We had dinner at a cafe and we saw the presidential palace and the 25 Julio Square. Some of the architecture is really beautiful, some appears to be people throwing apartments together with whatever building materials happened to be at hand. The downtown area is pretty nice, what we've seen of it so far. 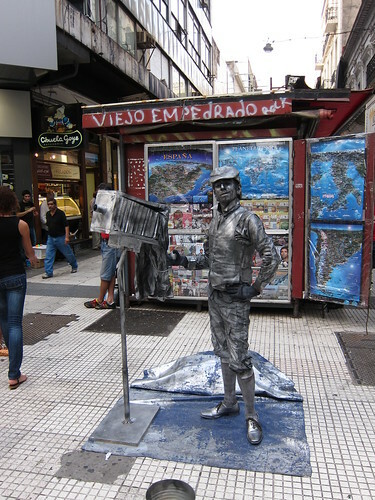 Tomorrow we have a visit to Tango dinner show and a bus tour of the city on our agenda. Hopefully we will not have jet lag. Feel pretty good now (had a headache on the flight, that was moderately miserable), we'll see what tomorrow brings. Didn't take any pictures today. I just wanted to get a feel for what the city was like and unwind from the flight. 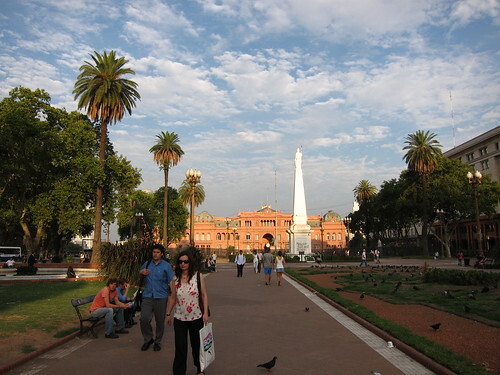 After like 24 hours of total travel, we have arrived in Buenos Aires. The flights (3) were all pretty good except that the last one left us stranded on the tarmac for 30 minutes with no gate assignment as the sun was rising. As I had only slept about 3 hours at that point, I was, predictably, slightly cranky about this delay. I can say though that LAN airlines does a good job, they have a nice video system for long-haul flights with a good selection of stuff to do. I didn't even freak out at all on the trip and got a little bit of sleep, which is a win for me. To answer Nobuo's question, I watched "Eat. Pray. Love." on the way over, which made me cry. It kind of seemed like a good movie to watch to start out this trip. It was a really good movie. I tried to watch "the American" but got bored with it in like 15 minutes and turned it off in favor of my Kindle (<3). We arrives at the Sheraton Liberatador, which is a Starwood property, and is, as expected, deliciously appointed and the staff seems outstanding. We crashed out for what was supposed to be 2 hours, but ended up being 5, before dragging ourselves out of bed to go for a walk. 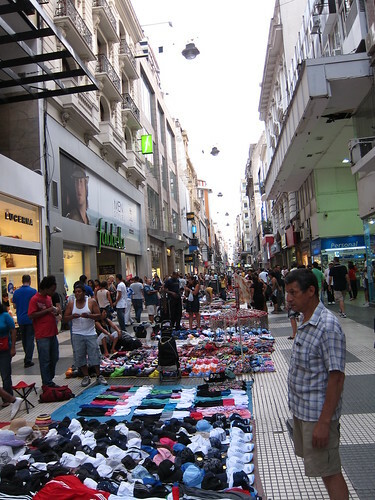 We found a pedestrian walkway called Calle Florida which has street vendors and shops on it. All very touristy and probably a rip off, but we were not looking to buy, only to walk and look and have some gellato, which we did. It was packed, and the street is super long, flanked by a park on one side and the providential palace on the other. I must admit that when we were driving in from the airport, I was a bit concerned because we passed through a whole bunch of shanty towns, which had buildings that looked like kids built them out of mud and Popsicle sticks, but once near our hotel, I can see why people love it here. The buildings are old and beautiful mixed in with new and unique. Everyone seems to speak some English and we are working on our Spanish so we seem to get by ok.
We had a pretty good dinner down the street at a small cafe and then walked over for a stroll in the park before returning back to our hotel. 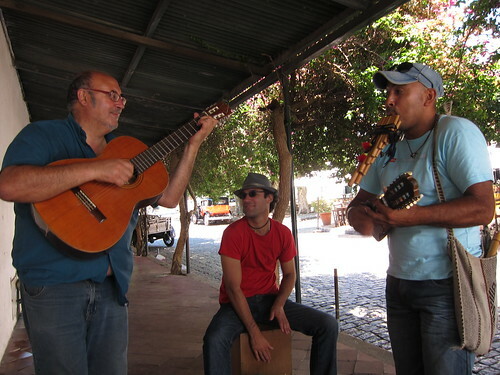 Tomorrow we head out for a city bus tour and then a Tango show. As you can tell, some pictures are up on my Flickr account, mostly of just interesting buildings from today, if you are interested. And now, I am off for a much needed shower and some reading before bed. 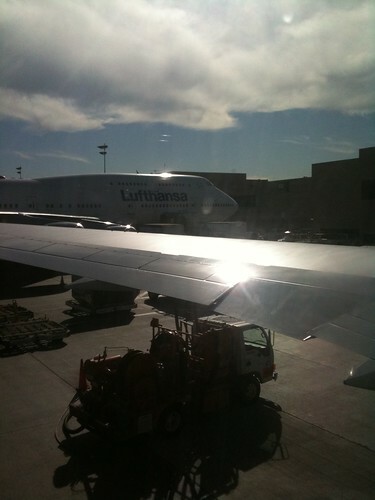 On board LAN 603 bound for Santiago, Chile, originally uploaded by Lbc42. 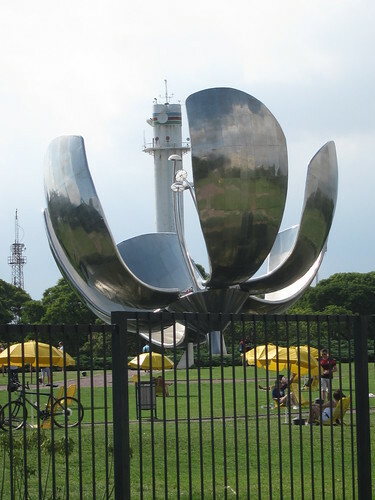 Then a short flight to Buenos Aires from there. We have arrived at the airport! And now begins our 20 hour journey to the bottom of the planet. We are pretty much packed, the house is pretty much clean, emergency contact info has been passed out and we have both freaked out about 10 times so far today. Looks like we are ready to go! 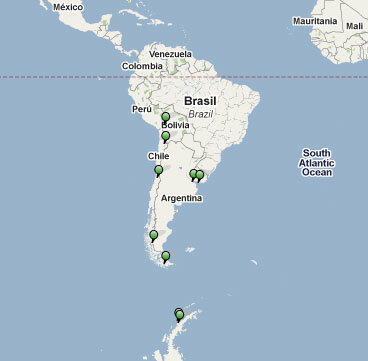 For those of you who would like a visual representation of where we are going on this trip, I give you: a map! There's more information about the specific destinations on the sidebar there -->.I listed the major towns and cities that we will be going to, although I am sure we will see much more than that. For example, when we go to El Calafate, we will actually be going there to see two glaciers, Los Glaciares National Park and Perito Moreno Glacier before they melt and make the ocean level rise (thanks global climate change!). More as it happens, I am sure! Go time in just over a week. This is where Chris and I will be posting to while we are on our trips. We hope you enjoy reading about our travels. There are links on the sidebar to help you find our pictures as well as other interesting information related to our destinations. If you think of anything that would be useful to have on the sidebar there, please leave a comment and we'll consider it! We will be updating whenever we get to internet, so RSS following may be easier for you than checking here all the time, but feel free to do whatever you wish. I will be writing blogs as I go and saving them to my computer until I get internet, so you might see clumpy, and yet thorough posting.